In order to ensure that the AFC is the beacon of best fundraising consulting practice, we encourage only companies who share our ethos and commitment. Therefore, if your company provides fundraising services to not-for-profit organisations in the UK (and Europe) we would be delighted to discuss you joining us. 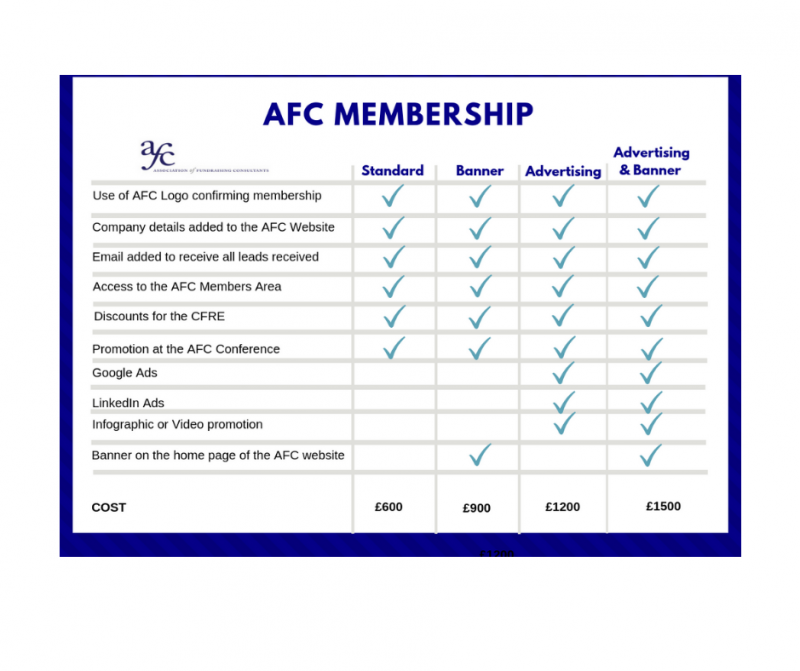 To become a member of the AFC we ask that you complete an online application form and provide TWO references from current and/or recent clients. We also ask that you provide TWO references every two years to ensure the highest standards of consultancy are being maintained. The AFC Board may decline an application in its discretion. We charge a basic £600 per annum for membership. This will give you the opportunity to have your company on the AFC website, use of the AFC logo on your own website, client spotlights and substantial reductions of fees for CFRE examinations and recertification. On top of that you may opt for extras to promote your company. Please see chart below.